The Designing Jewelers team are simply the nicest people. They know their stuff and work patiently with us to find rings exactly for us. 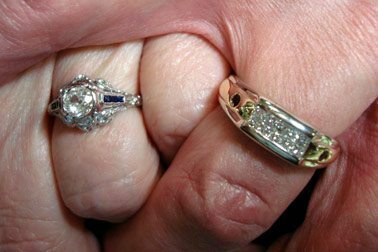 For the Fischer Family, Designing Jewelers has been their go-to Jeweler for the past 10 years. When Cathy and Michael visit Designing Jewelers, they are confident they will receive the guidance needed to realize their vision. With Designing Jewelers’ guidance, the Fischers have discovered three rings that differ in design but fit their personality and style. Cathy and Michael had looked extensively for a wedding ring for Cathy. Upon seeing the estate piece in the Designing Jewelers case, they knew it was exactly what they had been searching for. “It knocked our socks off!” The ring was a beautiful combination of platinum, diamonds and sapphires. 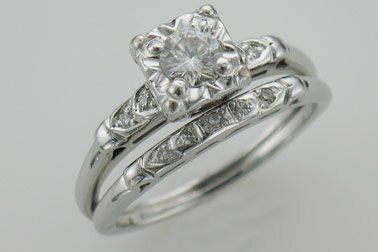 For Michael’s ring, he wanted a piece that would truly stand out from the rest. To do this, Michael’s jewelry team took a white and yellow gold ring with princess cut diamonds and added two rubies, one on each shank, to make it pop! Long-term relationships with our customers provide us the opportunity to really understand their style and personality. When the Fischers come to our store, we have so much fun finding the jewelry that is exactly for them.